With the incoming ship changes in Retribution and coming up in Retribution 1.2 new skills have been added and will be added. There will also be other skills that will make the entry into some ships simpler However, the skills that are added are support and secondary skills that will increase the length of time for a newer player to fly a ship very well. I had to take a two month break from turning my scout into a perfect scanner for the battlecruiser skill changes. She is also a combat pilot (technically) and it would have been silly for me to skip out on that part of the change. However, as I get back onto track to finish topping everything off to fives across the board I notice that becoming a maximized explorer takes some time. And while a new player may not have to have fives across the board I wondered if the bar of entry might be a bit higher than it needs to be. There is already a precedent for these things. Barges have become easier to access across the board. Skills are being lowered from V to IV in other places. There are still advantages to having a skill maxed out. I am not even thinking of decreasing skill lengths. Yet, I do not think that does not mean adjustments may not be something that should be looked at outside of the basics 'spaceship' accessibility tree. One of the five parts of the tutorial mission is the exploration missions string. These missions introduce players to what the various exploration sites are named and 'look' like. The player retrieves a certificate using a site appropriate module. The hardest part of these missions is learning how to use the probes. 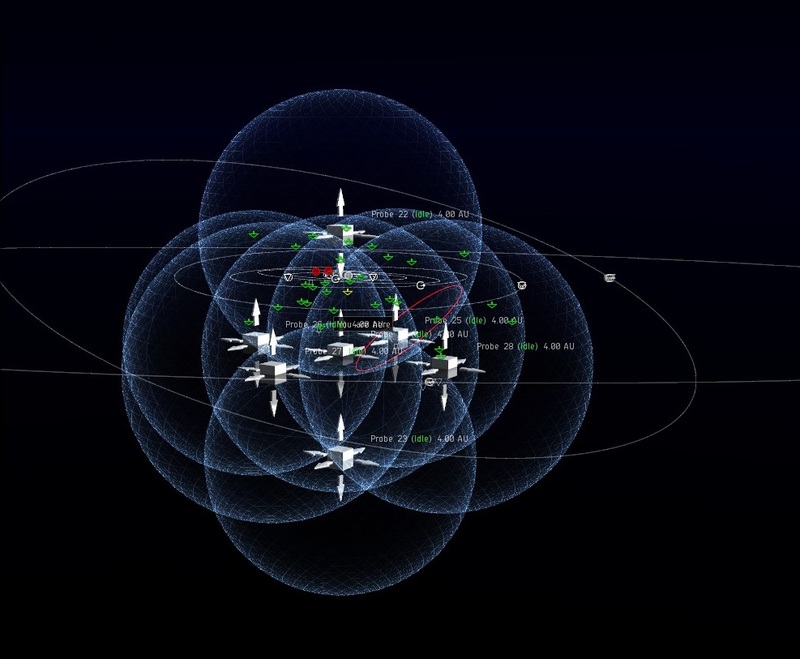 Exploration probes function on a three dimensional max. 3D is hard to explain in 2D. There are not exploration videos that can also be watched but, sadly the missions string remains one of the most frustrating unrewarding and unfriendly of the groups. However, some are lured in by the possibilities and still wish to explore. Recently, frigates were buffed and exploration frigates were brought up to a similar strength as Covert Operations (T2) frigates. For high security space, where the sites are easier to find this eased some of the first barrier someone had. A ship to scan with. A ship with bonuses to scan. To use the Magnate as an example it has a 7.5% bonus to its probes scan strength This improves the ability of the probes to find and narrow down the site. It also has a 5% bonus to the codebreaker, analyzer and salvager cycle timers. This speeds everything up and speed is ISK in this game. Comparing it to its T2 brother the Anathema one must remember that the Anathema is a Covert Ops frigate. It can fit a Covert Ops cloak which allows a ship to warp when cloaked. The Anathema also has other bonuses but the exploration related ones are a 10% increase in the scan strength of probes. It has a 10% reduction to survey probe flight time as well. Useful enough but one of those, "Okay. Sure. Does anyone one use this?" type of skills on a ship. The Anathema does not have the 5% bonus to the codebreaker, analyzer and salvager cycle timers. However, when one is using such a ship there would be a assumed suggestion that other relevant skills had been trained up to the point that the 5% bonus was no longer of interest as well as the other abilities of the ship overcoming them. A T1 frigate may use two gravity capacitor upgrades. This rig increases the scan strength of a ship by 10% each time. This means that for high security space a T2 frigate is not an absolute must for scanning strength which is good. It is good because ISK is a major barrier of entry. I noticed that T1 probe launchers do not have any scanning bonuses to them. T2 probe launchers have a bonus of 5%. Faction launchers have a bonus of 10%. T2 launchers take two weeks to train into. Faction launchers take the same time as T1 launchers but easily cost 50 million ISK. Should T1 launchers get a bonus? Or should the ability to fit a 3rd gravity capacitor upgrade rig onto a T1 ship compensate for the 10% given by a faction launcher for a new player? Astrometric Acquisition : Skill at the advanced operation of long range scanners. 10% reduction in scan probe scan time per level. Astrometric Pinpointing : Greater accuracy in hunting down targets found through scanning. Reduces maximum scan deviation by 10% per level. 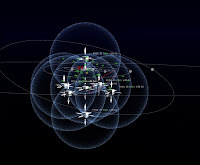 AstrometricRangefinding : Skill for the advanced operation of long range scanners. 10% increase to scan probe strength per level. This is one of those points where skill points vs career come into play. They are going to need some basic combat abilities as well as these specific modules. The skill spread for the items is also a bit broad. Salvager's are one of the items that a player should be able to use immediately, if poorly. Yet, its requirements cause the game to give the player a civilian salvager to not break up the timing it will take to use the regular salvager item. Similarly, the codebreakers and analyzers are also scattered about in their basic requirements yet each of these items is very important to the minimum needs of a new explorer. And then there is the fact that exploration leans so heavily towards T3(Tech 3) or Strategic Cruisers because people wind up wanting is all of these on one ship. Now, because each site has its own needs spare modules can be switched out without much effort. A Radar site will only user a codebreaker and the hacking skill. The Analyzer is not needed for this site. The salvager is optional if the explorer wishes to salvage any wrecks that they may make. The site may or may not have NPCs that guard the containers or spawn when the containers are interacted with. A Magnetometric site is going to potentially need a salvager and an analyzer I often get sites that need either or item for the cans. I thought that the little pop up would be a fair warning but sometimes I need both. Again, NPCs may be in the site and they may spawn upon can interaction. Switching out fittings, not having a one size fits all ship option in the first week: That's Eve. I'm okay with these things. A stream lining of the skills needed to access the equipment might not be a bad idea. Exploration is a career on its own but it is not stand alone. Combat skills, ship skills, and tanking skills are still completely relevant to someone entering an exploration career. Then there are Ladar and Gravimetric sites. These sites are both filled with harvestable materials. Outside of high sec, Ladar sites may resolve into either a gas nebula or a combat site with booster materials. Belt rats also spawn in both Gravimetric sites so normal mining precautions against such things are advised. Some explorers find Gravimetric sites and attempt to sell them to miners. If they will buy them, I don't know. It is done at times and an idea. I'd not seek to change the sites only smooth the accessibility for the newer player into the career. It is highly competitive, and sadly filled with experienced people in complex, well skilled ships (let's say Tengu cuz that's what I mean) clearing the sites out in seconds. I like the competitive aspect of it but because it is so competitive I wonder, should it be easier for new players to step into the competition. Exploration is a very rewarding career. If it was not aimed at new players I'd probably not have sat here and looked over all the bits and pieces and wondered. However, it is one of the five major tutorial strings. I've held many a hand and walked them through those missions and listened to them spew hatred for it. I was one that was so frustrated by them that I didn't start exploring for a long time afterwards. I guess some would say good, less competition. That's not my thing. Maybe more new explorers cleaning out the shiny bits of high sec would push some of those systematic Tengu site clearers out and into more lucrative space. (Not that I think that would ever happen because risk aversion). Hi Sugar, just a quick correction for your post. Tech I frigs can only use 2 Gravity capacitor rigs as well as covops due to calibration issues. Thank you. Corrected. Maybe they should be able to use three then. And the revised t1 scanning frigates all have at least 3 small drones, which is enough combat potential to solo any hisec radar/grav/mag site. Hisec exploration is more accessible than ever. Frankly, I found Astrometric Pinpointing a much bigger help than scanning %ages for resolving 'easy' sites faster. The serious percentages are for the harder W-space scans, and for PvP probing against people rocking ECCM. One other thing a new player can do who really wants to get involved in exploration is get Sisters of Eve faction gear to get the really good gear. CCP was even nice enough to put in level 3 and level 4 high-sec distribution missions so a player wouldn't get frustrated doing combat missions. I know it is a long grind to get the loyalty points but a new player can do it with almost no combat skills.